Third emperor of Rome; born Aug. 31, 12 C.E. ; assassinated at Rome Jan. 24, 41. He soon displayed the characteristics which made his reign a blot on Roman history. He formed a strong friendship for the Jewish king Agrippa, who, as the Romans thought, influenced Caligula for the worse. Later on, Caligula professed belief in his own divinity, and ordered altars to be erected to himself and worship to be paid to him. In Alexandria the Roman governor, A. Avillius Flaccus, tried to force this worship on the Jews, and made their disobediencea pretext for persecuting them. He even suppressed an address of homage which they purposed sending to Caligula. The governor was suddenly removed in the autumn of 38, and the condition of the Jews under his successor, C. Vitrasius Pollio, until the death of Caligula, is unknown. 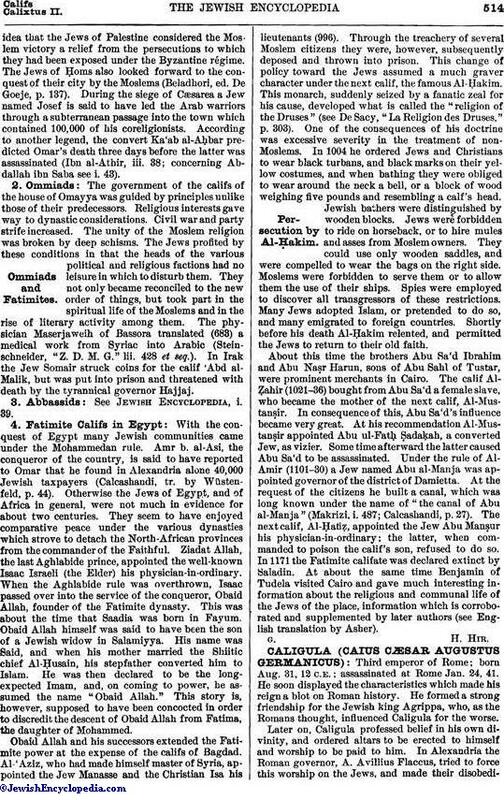 The discord between the Jews and the heathens of Alexandria continued. In the year 40 both sent delegations to Caligula, in order to present the matter to him and to win his good-will. 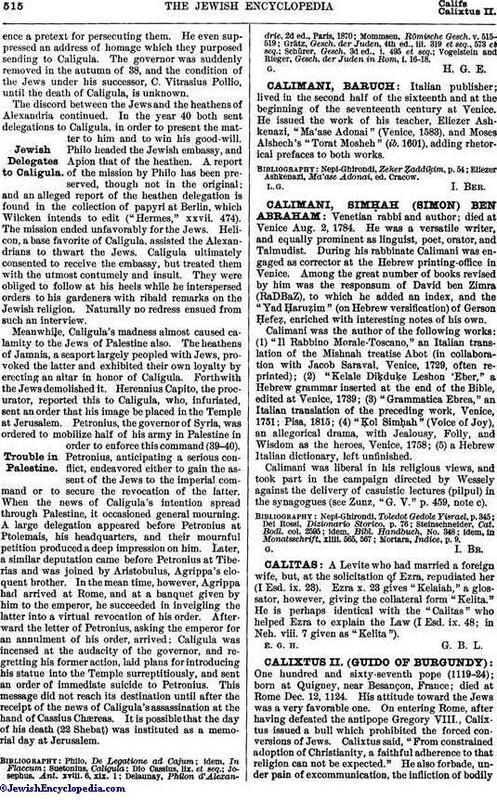 Philo headed the Jewish embassy, and Apion that of the heathen. A report of the mission by Philo has been preserved, though not in the original; and an alleged report of the heathen delegation is found in the collection of papyri at Berlin, which Wilcken intends to edit ("Hermes," xxvii. 474). The mission ended unfavorably for the Jews. Helicon, a base favorite of Caligula, assisted the Alexandrians to thwart the Jews. Caligula ultimately consented to receive the embassy, but treated them with the utmost contumely and insult. They were obliged to follow at his heels while he interspersed orders to his gardeners with ribald remarks on the Jewish religion. Naturally no redress ensued from such an interview. Meanwhile, Caligula's madness almost caused calamity to the Jews of Palestine also. The heathens of Jamnia, a seaport largely peopled with Jews, provoked the latter and exhibited their own loyalty by erecting an altar in honor of Caligula. Forthwith the Jews demolished it. Herennius Capito, the procurator, reported this to Caligula, who, infuriated, sent an order that his image be placed in the Temple at Jerusalem. Petronius, the governor of Syria, was ordered to mobilize half of his army in Palestine in order to enforce this command (39-40). Petronius, anticipating a serious conflict, endeavored either to gain the assent of the Jews to the imperial command or to secure the revocation of the latter. When the news of Caligula's intention spread through Palestine, it occasioned general mourning. A large delegation appeared before Petronius at Ptolemais, his headquarters, and their mournful petition produced a deep impression on him. Later, a similar deputation came before Petronius at Tiberias and was joined by Aristobulus, Agrippa's eloquent brother. In the mean time, however, Agrippa had arrived at Rome, and at a banquet given by him to the emperor, he succeeded in inveigling the latter into a virtual revocation of his order. Afterward the letter of Petronius, asking the emperor for an annulment of his order, arrived; Caligula was incensed at the audacity of the governor, and regretting his former action, laid plans for introducing his statue into the Temple surreptitiously, and sent an order of immediate suicide to Petronius. This message did not reach its destination until after the receipt of the news of Caligula's assassination at the hand of Cassius Chæreas. It is possible that the day of his death (22 Shebaṭ.) was instituted as a memorial day at Jerusalem. Vogelstein and Rieger, Gesch. der Juden in Rom, i. 16-18.